an upside down tomato planter. It was quite easy to make and time will tell how well it works, but it should reduce the amount of water needed to feed the plant and would be a great space saver. 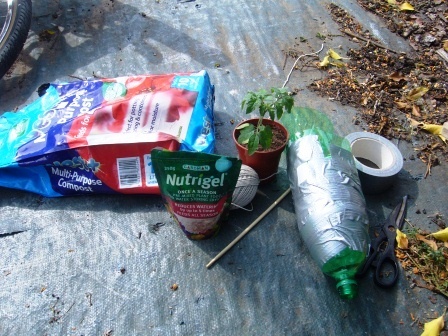 To make one you will need; 1 large plastic bottle, duct tape, a chopstick, string, scissors and compost. Be warned it is a bit fiddly! Cut the bottom off the bottle and poke some small holes in it, you will need this later. Next make holes in the side of the bottle to pass the chopstick through, this will be what you attach the string to hang it up with. 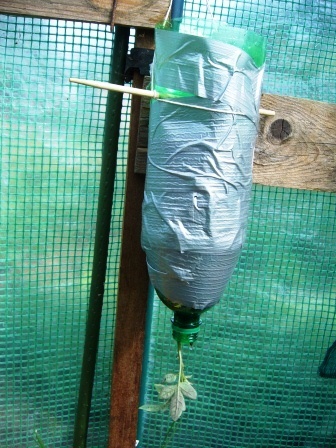 Then, VERY GENTLY feed the tomato plant through the neck of the bottle, use some rolled up news paper to help stop the plant falling through. Hang the bottle up in your chosen spot and fill with compost and wedge the inverted bottom back in the body of the bottle; it will act as a drip feeder. Lastly wrap the whole lot with the tape to hold it all together and protect the roots from the light. Feed and water regularly and keep your fingers crossed!